MAYA BROSCH is artistic collaborator with PLAY / Michèle Murray. Of Swiss nationality, she first trains in ballet, before studying “Mime corporel” with Etienne Decroux and Daniel Stein, as well as pantomime with Ella Jaroszewicz in Paris. She becomes a performer with the Magenia Company (Director: Ella Jaroszewicz, Paris) as well as with the Circus Rigolo, Switzerland, before creating the Mimobile Mimobile (later renamed Theater Corps Acteur). Drawing from these experiences, her approach merges dance with mime and physical theater, and she creates numerous pieces which tour across Europe. She then settles in Berlin, teaching physical acting and mime while studying contemporary dance and performing with various companies. 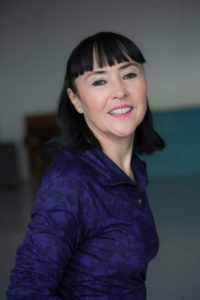 She holds the French contemporary dance teaching degree (Diplôme d’Etat professeur de danse contemporaine) and mime diploma (Diplôme d’artiste mime).